New Norfolk NEWS: New Norfolk for dummies? A screengrab from the video clip. Click image to enlarge. A TRIP to New Norfolk by river ferry is one of the elements of a new $9 million marketing campaign launched this week as part of Tourism Tasmania's "Go Behind the Scenery" initiative. 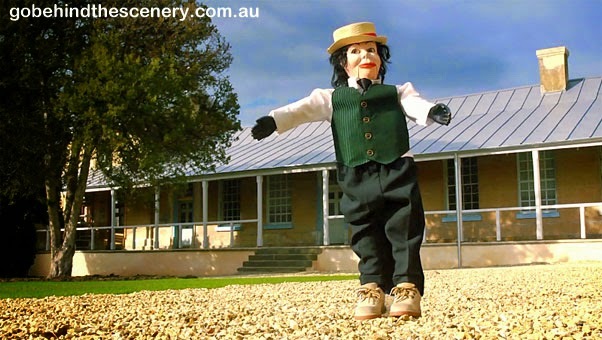 It features a curious video clip presented by a ventriloquist's dummy which travels from Hobart by water taxi and goes on to visit a number of points of interest including St Matthew's Church and the barracks at Willow Court, plus a number of antique shops. The character describes himself as a local but has an unusual pronunciation of New Norfolk and repeatedly describes Tasmania's third-biggest town as as a "little village". The two-minute clip ends with the host falling in love with a female puppet in one of the antique shops. The new campaign is receiving a mixed reaction on social media. See the clip for yourself here. I love it! About time something different was done, rather than another droning campaign with a maudlin voice saying "Come here ... please". Plus the dummy is significantly more intelligent than Laura Bingle. johnd - do you mean Lara Bingle perhaps? Given she did not do any ads for Tourism Tasmania, I hardly think there's a comparison.